“Migrants are our brothers and sisters in search of a better life, far away from poverty, hunger, and war.”(Pope Francis, Pontifex, July 8, 2017) Our world is facing the migrant or refugee crisis, in all corners. The European refugee crisis, daily we heard of drowning, disappearances and deaths along the Mediterranean sea; the Rohingya crisis, risking death by sea or on foot, nearly 700,000 have fled the destruction of their homes and persecution in the northern Rakhine province of Myanmar (Burma) for neighbouring Bangladesh since August 2017 (https://www.bbc.com/news/world-asia-41566561); and the current Migrants’ Caravan in Latin America, almost 14,000 migrants from Honduras, Guatemala and El Salvador fled from their homes all driven by poverty, homelessness, persecution and violence. 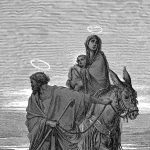 In the timeline of Jesus’ incarnation there is an imagery of challenges haunted by fear and poverty; and yet more important, is the providential hope among those who journeyed with them. His parents lived with the available means of migrants—limited clothing, food ration and generosity of fellow migrants. Jesus was there, in the company of those seeking a livable future. “Rise, take the child and his mother, flee to Egypt, and stay there until I tell you. Herod is going to search for the child to destroy him.”(Matthew 2:13). Unknown to him, there are indeed many stories of encounters of his parents all along the alleys of nights, in marketplaces, or in the company of the poor, of the shepherds. The Migrants’ Caravan reflects our on-going journey to live a dignified life. In a world colored by exclusive citizenship, in the borders of the chosen; as if we were not foreigners before—we are all strangers, deserving of the welcoming inn. Faced with the realities of poverty, hunger and violence in their different homeland, they are walking more than a thousand miles to have a better life, not of their own but for the future of their children. 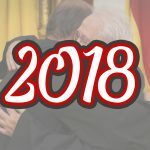 Pope Francis strongly said: “Political addresses that tend to blame every evil on migrants and to deprive the poor of hope are unacceptable…”(Message Of His Holiness Pope Francis, For The Celebration Of The 52nd World Day of Peace,1 JANUARY 2019, Good Politics Is At The Service Of Peace). The crisis faced in the current migrants’ caravan (and of the refugee crisis) will ripple social ills, from the traumatic challenges in their countries of origin to the violent security measures in the Mexican and U.S. borders. They endured the caravan, and now they are at the threshold of the US border, unwelcomed by the land of immigrants; and of a purchased property (which many calls their own). With the hope of entering in the United States of America, garrisoned by the biases of the current administration now heavily militarized and hoping to build a $5 billion border wall; the migrants can hardly enter the US. In his message to the Scalabrinian missionaries, Pope Francis said: “we have this tragedy today: of a demographic winter and a closing of doors. This should help us somewhat to understand this problem of welcoming the foreigner… let us think about the caravan that is travelling from Honduras to the United States… May you feel as migrants do. Yes, feel like you are migrants, migrants facing needs, migrants before the Lord, migrants among you…” (http://w2.vatican.va/content/francesco/en/speeches/2018/october/documents/papa-francesco_20181029_scalabriniani.html). There are many ‘new’ faces of ‘migrating families,’ families driven by climate disasters, families faced with economic challenges, families challenged by moral devaluation, and families experiencing drug killings. This is the new normal. Millions of people are facing these issues now and in the future, a dark reality existent even before the foundation of the United Nations. Poverty, hunger, oppression and wars are the major causes of migration and refugee crisis. Countries, the wealthy ones, must work together in solving the crisis. This is happening, in the global south, in the developing countries; and the crisis engages the economically developed countries, for most of the migrants sought ‘in transit’ in these states. That instead of being in proxy wars, military agitation; trade wars and embargo—nations must work in the diplomacy for humanity, a more humane and seeking integral development for those who have less. We are seeing all these in the increased military budget, heightened security alertness; but less of a commitment to offer development. Undeniably, cultures are nourished, even continued in the positive realities of migration. Reframing our ‘gated’ countries into a welcoming culture enables us to better provide opportunities of hope to those seeking a better life, not of their choice but from the circumstances of famine, war, and destabilized origins. 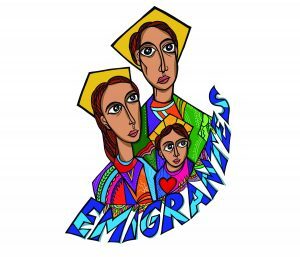 In the heart of Jesus, he understands the plight of migrants; his parents lived thru the struggles of their journey. For every person, the home is where the heart is, not of selfishness, but in communion with families, together with them—in the wealth and richness of togetherness, whether in pain or in persecution. All these contributing evils of migration can be replaced by the narratives of peace and integral human development; and yet our government leaders and powerful countries still speak of exclusion, border security and trade agreements. War, hunger and poverty continue to be a reality in this so-called ‘civilized’ times—all at the expense of families ‘in transit’for a livable future. This drawing, made by the author of the article, has illustrated the Christmas greeting of ARCORES.